This past week has been crazy busy(as I'm sure all you moms out there know). Thursday night was "Meet the Teacher." Its basically a chaotic night where you label your supplies, put them away, meet your new teacher, get a headache:) , popsicles afterwards, etc. Aubrey is a pro at this stuff now:) And Ella just soaked it all in. She is waaaaay excited to go to school-its so cute at this age the excitement they have for it all! 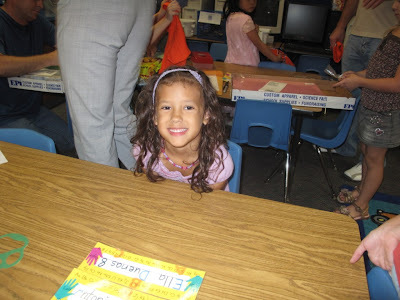 I didn't take pictures but at the last second I remembered to bust out my camera and I snapped a shot of Ella at her future desk:) Lookin all grown-up. . .I decided not to make Aubrey pose in her class(she is a second grader after all). Saturday morning was Park Day for the kindergartners. 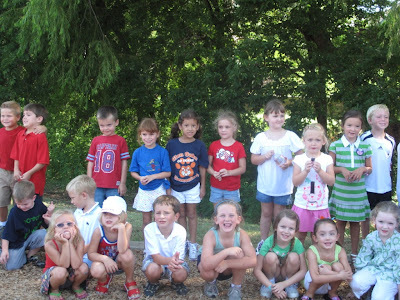 Each class was assigned to wear a certain color shirt and then met at the playground by the school. Its supposed to be a way for the kids to meet each other and play before the first day of school(a GREAT idea!). Ella had a fun time. . .here she is with a few of her fellow Glen Oaks Tigers. I did all of my school shopping last month(go me!) so we spent the rest of Saturday having fun. 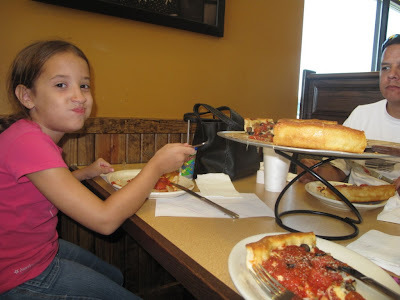 We decided to try Rosati's pizza for lunch and WOW their pizza is incredible! LOVED it. 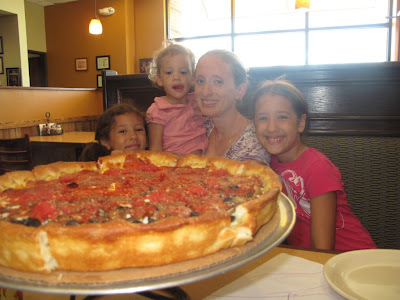 We ordered a Chicago-style deep dish and we were impressed. See Cali's tongue sticking out as she eyes it? She couldn't wait to dig in. 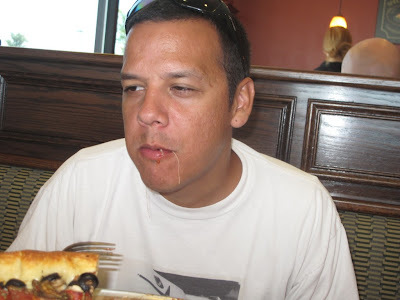 Sorry Joey, I had to post this. . .cheese hanging off his chin and coming out of his mouth. Haha. Signs of a great pizza. 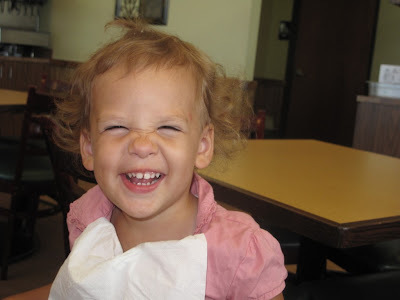 Cali has gotten to where she totally hams it up for cameras. . .as soon as I pointed it at her, she did this. Cutie. Aubrey really loved it-she ate as much as I did! Thats my girl. 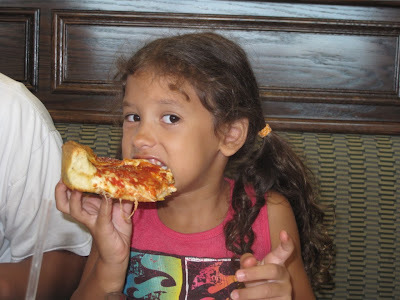 Ella eating a slice of pizza almost as big as her head. This one just makes me laugh. So basically, I really recommend this pizza place-YUM! The best pizza I've had since I was in Chicago last year. After lunch we took Ella to get her ears pierced(see previous post), then came home, I went to Sam's Club, then took Ella to a birthday party, and then Joey and I took Aubrey to take some pictures. We got her baptism dress in the mail a few days ago and Joey took some AMAZING pictures of her in it. So so beautiful. I can't wait to post them! It was a busy fun weekend. School starts tomorrow. AHHHH! Where did the summer go? Seriously?!! Seriously I have NO IDEA! It makes me sad we are already on a tight schedule for school time around here, but that pizza, oh that pizza, now that is a sign of a great night! Such great ideas for the beginning of school year and all. I'm not sure if very many schools down this way do any of that but they are all great ideas. Now that pizza is a whole other ball of wax I mean cheese. You are a pizza family for sure. Such great ideas for the beginning of school Holly! You are making special memories for your girls and family for sure! 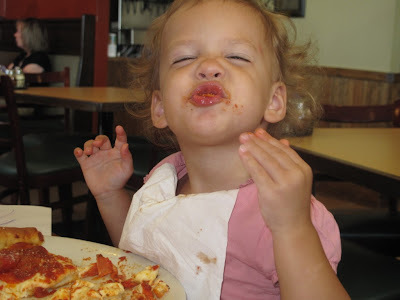 I loved all the pictures, and that pizza, well it looks wow! Can you believe I had not had a take out pizza since I moved here to England? I know, 9 years is far too long! I need to rectify that! That pizza looks sooo yummy! I'm going to have to try out that place soon. Looks like you guys had a fun weekend. Can't believe school starts today. This summer went by to fast. Ella got her ears pierced!